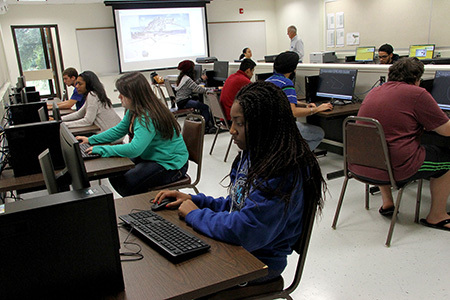 West Windsor, N.J. – Engineering, architecture, and technology will be the focus of an Open House at Mercer County Community College (MCCC) on Saturday, May 9 from 10 a.m. to noon. The event will take place on the college’s West Windsor campus, 1200 Old Trenton Road, in the Communications Building, Room 108. Lunch will be provided. According to Professor James Maccariella, P.E., Coordinator of the Engineering Science program, college degrees in these fields hold the promise of high-paying, in-demand jobs. Prospective students and their families will learn about the varied options for employment, typical salaries, transfer opportunities to four-year colleges and universities, and MCCC scholarships. Licensed Professional Engineers, Registered Architects and college professors will be on hand to answer questions and provide tours of the labs and other college facilities. To register or for more information, email maccarij@mccc.edu or call 609-570-3462.